J. L. Jackson was James Lander Jackson (1818-1888). He was born 29 August 1818 in New York City, and died 5 Oct. 1888 in Yonkers, NY. He is listed in New York city directories from 1842 as a manufacturer of grates and fenders at 315 Stanton St. The following obituary appeared in the New York Times, 7 Oct. 1888, "James L. Jackson died at his home in Yonkers Friday. He was born in this city Aug. 29, 1818, and established himself in the iron manufacturing business here in 1840. For many years he was very prominent in his line of business, and when he sold out in 1882 to what is now known as the Jackson Architectural Iron Works he was one of the oldest men engaged in it. He erected the iron portion of many prominent structures of this city, among them the Harpers' building, the Potter Building, Cooper Institute, the Grand Opera House, and the Mills & Gibb building. He was an inventor, and obtained about 100 patents. During the war he made shells for the Government. He was a strong Republican, and the during the draft riot the mob attacked his place. He leaves a widow, two daughters, and two sons. His funeral will take place from the residence, 497 Riverdale-avenue, Yonkers, at 4 o'clock this afternoon." The 1850 U. S. Census (non-population schedules) recorded James L. Jackson, Iron Foundry as having invested $32,000 in capital, and owning materials consisting of 1200 tons of pig iron and 500 tons of coal valued at a combined total of $24,600. The foundry employed an average of 95 workman and paid average monthly wages of $3700. The annual product consisted of 500 tons of "grate castings" worth $50,000 and 500 tons of other castings valued at $40,000 for a combined total of $90,000. These were impressive figures for the time. Thirty years later James L. Jackson, iron foundry, was enumerated again in the 1880 U. S. Census for industries. At that time capital invested had increased to $250,000. The greatest number of workmen employed was 230, and the total amount paid in wages during the year was $78,552. The value of materials owned was $106,258, and the value of the past year's product was $210,598. In the early 1850s J. L. Jackson opened a second location at 55-65 Goerck St. Then in 1857 his directory listing announced that the business would "remove in September to Twenty Eighth street, a few doors east of Second Av." The business prospered and expanded on E. 28th St., and remained there until closing in the early 1880s. 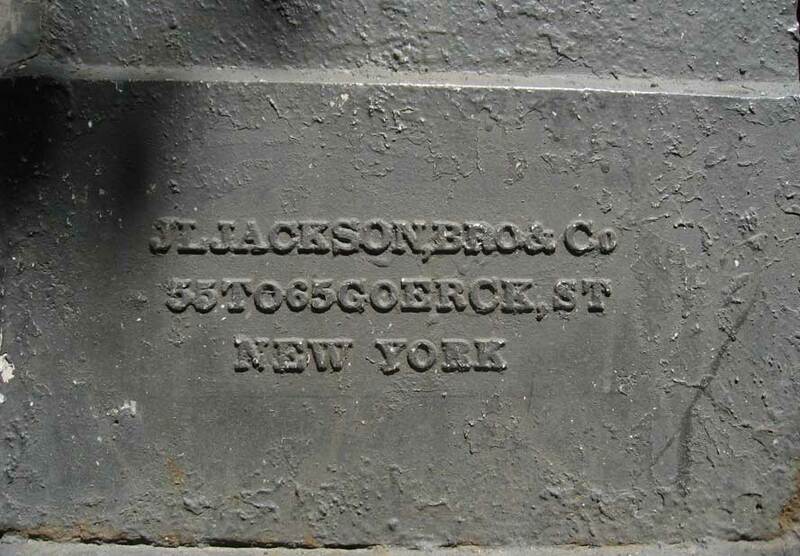 This ad for J. L. Jackson, Brother & Co. dates from 1853 when they were located at 313 and 315 Stanton St. and 55 to 65 Goerck St. This ad for J. L. Jackson, Bro. & Co. appeared in the New York Times, 1 March 1854. I don't think any of the buildings in this list exist at this time (2011). This ad for James L. Jackson's Iron Works appeared in the New York State Business Directory, 1859. "The size of the works has been already mentioned. Its chief divisions are two casting-houses -- the one for heavy architectural work being 160 x 50 feet, and facing Twenty-ninth-street; the one for light work is 158 x 90 feet. Both are well arranged as to light and conveniences. The machine-shop on Second-avenue is 178 x 50 feet. The court-yard inclosed is 138 feet square. The whole establishment has cost some $200,000, and will employ, when in full operation, 250 men. One important feature deserves mention. The proprietors have not forgotten the wants of the operatives. A large central apartment, well warmed and lighted, is devoted to a wash-room, with a supply of Croton, which must contribute to the general health and comfort." This lithographic view of the Jas. L. Jackson & Bro. works at the corner of 2nd Ave. and 28th St. was sent to me by John L. Arntz, a descendant of James L. Jackson. Details show an entrance on 2nd Ave. and the 315 E. 28th St. building. During the years 1864-1865 James L. Jackson was taxed on his personal property and income something approaching $1500. These included income in 1864 of $4384 and $286, and in 1865 of $4400 and $12,094. Personal property taxed included 115 ounces of silver plate (1864) and 90 ounces of silver (1865), a carriage, 4 watches, and 2 pianos. Tax on his income in 1865 amounted to $1429.40. The business at 167-169 E. 28th St. was also taxed. Two assessments in 1865 valued his finished work and castings at $3959 (Feb.) and $2050 (March). Tax on these amounted to $302.58 (Feb.) and $174.75 (March). In 1867 James L. Jackson applied for a passport, where he declared that he was 48 years old, that he was born 29 August 1818 in the city of New York, and that he was the proprietor of an iron works located at 167 E. 28th St., New York City. The Bro in J. L. Jackson, Bro. & Co. was Peter H. Jackson (1829-1908). He first appears in New York city directories in 1852/53 with "Jackson J. L., Brother & Co. iron foundry, 55 & 65 Goerck." An entry in Trow's 1877 directory indicates that he moved to California around that time. In the 1870 U. S. Census Peter H. Jackson lived in New York's 19th Ward, District 10, with his wife, Mary, and four children, Charles, Carrie, Frank and Addie. In the 1880 census P. H. Jackson, age 51, lived in Oakland, Calif. He lived with his wife, Mary, and 3 children, listed as C. C. (Caroline), R. (Robert) and E. R. (Edwin R.). In the 1900 census Peter H. Jackson lived at 1379 8th Ave., Oakland, Calif., with Mary, his wife of 47 years, mother of 7 children, of whom 5 were living. Jackson's occupation was described as "Iron Builder." In 1897 Peter H. Jackson published Improvement in Building Construction Mainly Relating to Artificial Stone and Concrete of Portland Cement and Its Constituents Combined With Iron and Steel (available as a Google Book). This was published by P. H. Jackson & Company, 228 and 230 First Street, San Francisco, Cal. This 44-page document seems to have been used to promote Jackson's patented methods for construction of sidewalks and roofs with stone and steel combinations. His patent 583,685 for "Floor, Roof, or Sidewalk Construction" was dated 1 June 1897. Jackson secured numerous other patents relating to construction methods between the years 1882 to 1907. Peter H. Jackson's obituary notice in the New York Times, 18 June 1908, read, "Peter H. Jackson, one of the founders of the James L. Jackson Iron Works, the first firm to make iron and steel work for building purposes in New York City, died of old age yesterday at his home in East Oakland, Cal., aged 79. His father was Hugh Jackson, pioneer in the fireplace business in this city and a member of a family which has been in the iron fashioning trade here since 1745. The James L. Jackson Company supplied the iron structure of which the old Times Building, at Nassau Street and Park Row, was built. Mr. Jackson leaves a daughter and three sons, Caroline C., Edwin R., and Robert A. Jackson, now in Oakland, and Francis D. Jackson, Vice President of the Hecla Iron Works of Brooklyn." At a later time Peter Jackson's son, Francis D. Jackson, was president of the Hecla Iron Works. Sarah Bradford Landau and Carl W. Condit, writing in Rise of the New York Skyscraper, 1865-1913 (1996), credit James L. Jackson with providing the iron framework for the Harper & Brothers all-iron printing plant (designed by John B. Corlies, 1854) on Franklin Square: "Corlies's building was almost a glass shell supported by a frame made chiefly of iron. This frame consisted of fluted Corinthian cast-iron columns manufactured by James L. Jackson..."